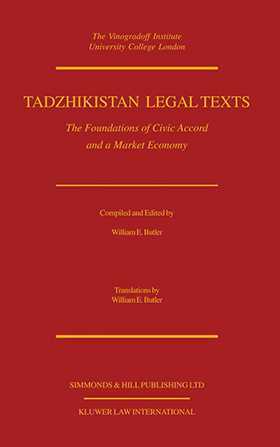 This important volume contains an extensive collection of Tadzhikistan legal texts translated and edited by the eminent scholar William E. Butler. All material is translated anew and is prefaced by an introductory note on the legislative history of each enactment and a contextual observation. The documents translated in this volume have been chosen for their fundamental importance in understanding the Tadzhikistan State structure and legal system and the peace process intended to achieve civil accord. All are in force, and there is a strong emphasis upon those enactments of key importance to the foreign investor. The broad scope of this work will provide the practitioner, legal scholar, government legal adviser, and student an excellent reference tool for understanding contemporary Tadzhikistan legal structures. This is the second volume in the CIS LEGAL TEXTS series edited by William E. Butler. The first volume of the series, Russian Legal Texts , was published in 1998. Foundations of the State Structure. Resolution of Civil Conflict. Rights of Man and Citizen. The Judicial System and Other Tribunals. The Legal Profession. Instruments of a Market Economy. Foreign Relations Law.